The leading cause of fatal fires in the US is unattended cigarettes catching fire. 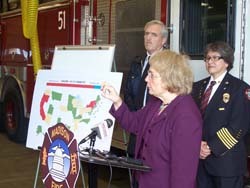 A bill proposed by State Senator Judy Robson (D-Beloit) could help prevent many of those deaths. The legislation requires all cigarettes sold in Wisconsin to utilize "fire-safe" technology. It consists of a special type of paper with built in stops to prevent a cigarette from burning if it&apos;s not being smoked. Robson says the technology would prevent unattended cigarettes from catching clothing or furniture on fire. Robson says some cigarette makers are already willing to make the change. She expects the technology would be easy to implement as well, since fire-safe cigarettes are already being sold in several other states. Similar legislation has already passed in 22 states.